It’s “East Meets West” at Z Gallerie. 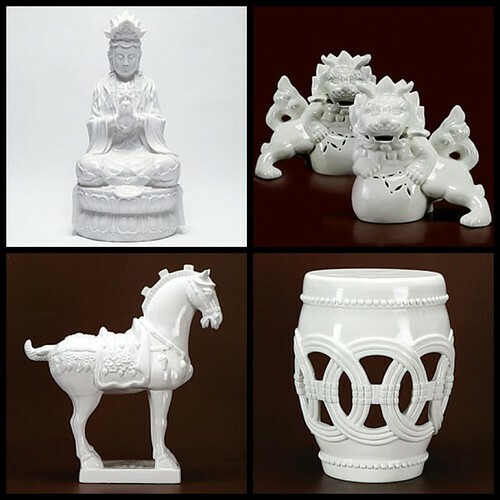 One of my favorite stores for unique accessories, Z Gallerie is offering a whole new line of blanc de chine inspired pieces, bring 17th Century China into today’s 21st Century homes. This Spring find beautiful Asian ceramics like this Guan Yin statue, the ever popular Foo Dogs, and this beautifully carved Palmer Stool. It was Courtney Barnes at Style Court who introduced me to the resurgence of blanc de chine art in homes with modern sensibilities. And stores like Z Gallerie, Anthropologie, and even Domino Magazine has been embracing this new “East Meets West” style. What could be more appealing than white ceramics that are able to blend seamlessly into the modern home, offering a worldly appeal without a typically “themed” interior? I guess I know where I’ll be this weekend, building my own “East Meets West” collection.